Shown above are custom carved High-Density-Urethane room name and number plaques. 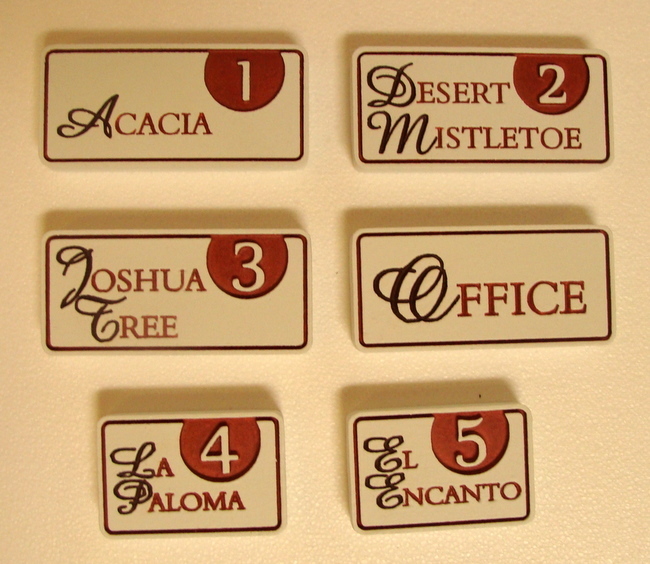 They feature engraved/recessed letters, room numbers and a border. The red areas around the room numbers are carved out so the numbers are raised. The plaque backgrounds are smooth. This plaque and similar ones can be made of painted High-Density-Urethane (HDU) or stained and painted wood of various species (e.g., Redwood, Oak, Maple, Mahogany, Cherry) . This numbers and borders are hand-painted red and black. The plaque is clear-coated twice. This room number plaque can be easily mounted with screws or epoxy on an outside wall, a room door, or an inside hall wall next to the room door.